We know Active Transportation works! Here’s the why and how…. The Utah Active Transportation Benefits Study was completed in 2017. 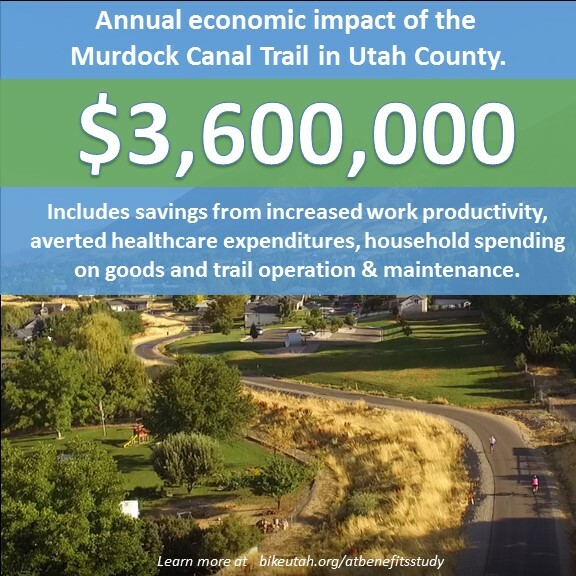 A collaboration between numerous partners, the results quantify the economic and health benefits that bicycling and walking bring to Utah. The Study allows planners, communities, and businesses to assess upcoming programs and projects and better understand how they will improve access to bicycling and walking for transportation and recreation. The Best Practices document provides concrete examples of what communities across Utah can do to increase active transportation and realize even greater economic and health benefits. You can use the Economic Impact Calculator below to determine the economic and health impacts that bicycle infrastructure and events will have on your community. On the first page of the calculator spreadsheet, there are directions as to how you can input your project into the calculator. The subsequent documents on this page form the foundation for this calculator, so some familiarity these documents will be helpful in using the calculator and assessing the outputs. The Final Report provides a comprehensive overview of how active transportation impacts the economy of Utah and the health of Utahns. The Final Report also includes case studies from different projects in Utah. The Literature Review looks at similar studies from other states and forms the foundation for the Final Report and Economic Impact Calculator.